Poodles have been in existence for many centuries and historical reference to them has been found in Germany, England, Italy and France. In pictorial evidence the dogs nearly always appear in the traditional lion clip, which leaves the hindquarters bare except for leg bands and a pom-pom on the tail, while the forequarters are heavily coated except for the face and legs. This appears to indicate that these dogs were used for sporting and retrieving purposes. As the coat is quite heavy when wet, they were clipped in areas to alleviate weight. The tail was docked as a long tail would be caught in the undergrowth. The ribbon on the topknot was to indicate that the dog was working and also to signify it was not a bird or other animal. The word Poodle itself is said to derive from the German word ‘pudel’, meaning to splash in water. Although three varieties of Poodles are recognised, they differ in size only and are closely related. The largest, the Standard Poodle, is the oldest variety and was used as a water retriever. The smaller Poodles have become more and more popular. The Miniature Poodle is the medium-sized variety and may be closer to the original Poodle in height than the present Standard size. It was originally called the Toy Poodle, but the name was changed when the smallest form was recognised. Poodles, similar to many other breeds, have a double coat that has the quality and appearance of lamb's wool. 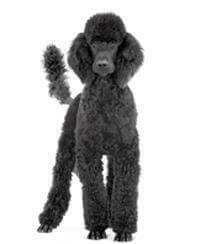 Poodles shed hair similar to other breeds, but this hair is caught and trapped by the undercoat and packs down. Poodles must be groomed regularly or the coat becomes a knotted unsightly mess. The coat of a Poodle, although requiring more grooming than most other breeds, is particularly advantageous for people with allergies. Best of all, carpets, furniture and clothes will remain hairless and odour free. A balanced diet, regular exercise and routine are needed. Every dog must be house-trained, obedient and easy to manage. Love is the most important requirement of all. In return, you will be rewarded with love, loyalty and protection from your Poodle, regardless of its size.